Landing nearly $100,000 through a successful Kickstarter campaign that closed earlier today, a group called Oso Technologies will be manufacturing a device that helps people keep their indoor and outdoor plants alive and thriving. 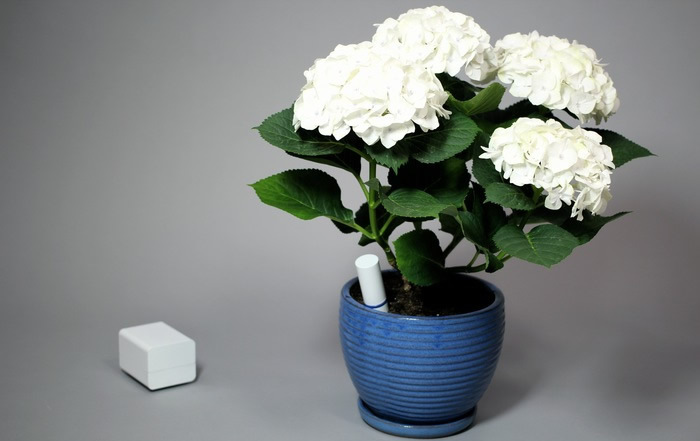 Called the Plant Link, the white cylindrical device is inserted into the soil next to your plant. After the user assigns the device to a specific type of plant through the Plant Link site, the device will have a measurement standard in place to constantly judge the amount of water in the soil. Over time, the Plant Link will be able to use that information to make adjustments to the watering schedule. If there are multiple plants in a household, the user can connect all of the devices to a single base station. The base station connects to the router within the home and the information about the water levels are sent to the cloud. 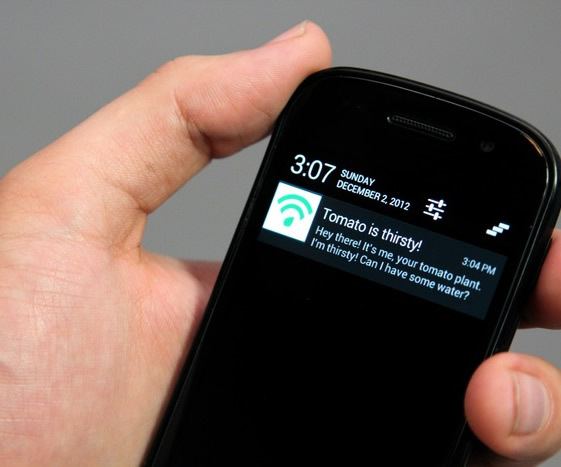 Users can access the soil data through the Web or receive updates about their plants over email, text messages or push notifications on a mobile device. In addition to the Plant Link and base station, Oso Technologies has also developed a device called the Smart Valve. Designed for outdoor use, the valve connects to a home’s water source as well as the hose that’s connected to the sprinkler. Using information from the Plant Link, the Smart Valve regulates the flow of water to the sprinkler automatically based off the water levels in the soil. According to the Kickstarter page, the Plant Link device measures water levels within the soil every five to ten minutes and utilizes a common algorithm used within the agriculture community to analyze the soil. The software also takes the type of soil into account when calculating the need for more water. The watering schedule is automatically updated after each reading and the schedule is also altered for outdoor plants when specific types of inclement weather are active in the area. Regarding specific plants, Oso Technologies plans to curate the plant database and add new plants as needed by users. The Plant Link device can be positioned up to the length of a football field away from the base station, potentially ideal for small commercial areas in addition to a standard household. Hypothetically, this device could help businesses save money on the cost of watering landscaping or perhaps completely automate the watering process at a plant nursery. Oso Technologies plans to manufacture the device in the central Illinois area and the group currently has prototypes that are ready for the manufacturing stage of development. Beyond the closed round of Kickstarter funding, the group hasn’t created a page yet that will allow a consumer to order the Plant Link device. Assuming the manufacturing schedule stays on track, Oso Technologies plans to deliver the first batch of the Plant Link device into the hands of backers by June 2013. The prices range from $99 for the basic package with the base station and three Plant Link devices up to $149 for the basic system along with one Smart Valve. It’s likely that Oso Technologies will sell the various components separately as well.